Central Union Church, a historic landmark church in Honolulu, decided to become a Cool Congregation at the invitation of Hawaii Interfaith Power & Light. This matched with Central Union Church’s (CUC) desire to be better stewards of God’s Creation while seeking to be good fiscal stewards. Founded in 1924, Central Union Church (CUC) sits on an 8.4-acre campus with an active pre-school, kindergarten and adult day care center. Throughout the week, the church allows various community organizations such as the Boy Scouts and Alcoholics Anonymous to utilize its facilities, which adds to the cost of electricity. In Hawaii, the cost of electricity is around three times as expensive as in the continental United States. In October 2012, CUC’s electricity costs had increased to about $220,000 annually or almost $20,000 per month! After a professional energy study with recommendations, Central Union got busy with the changes, which included: a complete lighting retrofit to LEDs and energy efficiency fluorescent lights; window tinting; and the installation of a very smart, campus-wide air conditioning system that adjusts automatically to environmental conditions. Total CO2 emission reductions add up to around 138 tons per year, and have reduced energy costs by $64,000 per year. 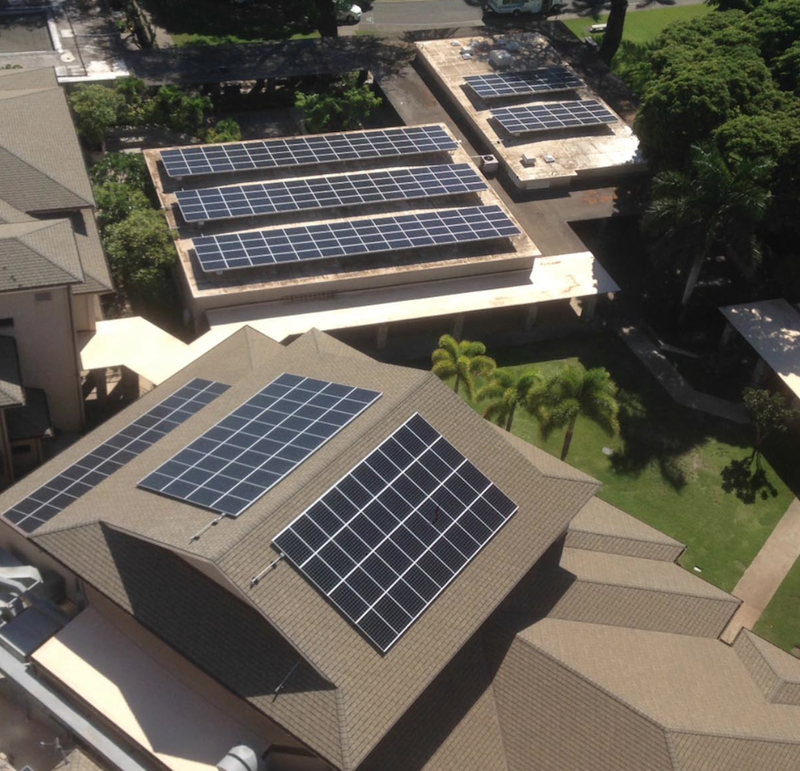 All of this was made possible by the non-profit named the Hawaii Community Reinvestment Corporation (HCRC) that lends money for energy retrofits to non-profits to help them reduce their energy costs. The funding interest is so low and the energy savings is so significant that CUC is able to pay for the loan payment through the energy savings from the retrofit. The second part of CUC’s energy reduction was the installation of 336 of the world’s most powerful photovoltaic (PV) panels (Sun Power 345 watt panels). These PV panels will produce 179,318 kilowatt hours of electricity each year fulfilling 28% of our churches electrical needs! This system will decrease our CO2 emission by 254,273 pounds annually and will reduce our oil usage by approximately 445 barrels each year, eliminating 14,590 pounds of nitrogen oxide pollution per year. (The impact of one pound of N2O on warming the atmosphere is over 300 times that of one pound of carbon dioxide.) What is especially important to note with the installation and the recent completion of the energy audit, CUC has reduced our energy usage by over 50%.